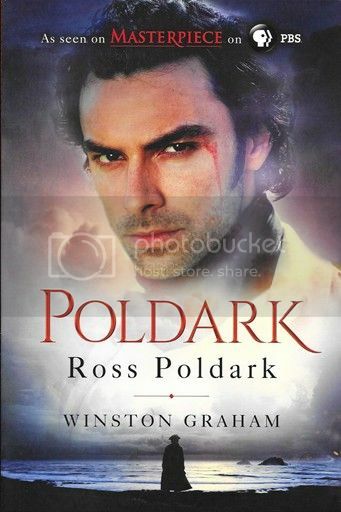 Work kept me writing more than reading this month, but I did discover a new-to-me historical author who knocked my socks off, so my pick for May's book of the month belongs to Winston Graham and his Ross Poldark: A Novel of Cornwall, 1783-1787. I'll confess, despite being a history buff I had never heard of Mr. Graham or his Poldark books. They're classics, so I should be ashamed of myself, but I think it's because I lean more toward historical nonfiction versus fiction. This one caught my eye after I saw the first episode of the Masterpiece Theater series based on the Poldark books as part of a preview on the tail end of a BBC DVD. Say that seven times very fast and I'll give you a cookie. Seriously, the preview was interesting enough to prompt me to look for the book version, and once I found the newly-released reprint I decided to invest in a copy. If you like history, Cornwall, romance and/or drama, read this book. It's amazing, from the painstaking research that flows effortlessly on the page to the absorbing characters to the great, gritty realism of the storytelling. It's one of those very rare books that will appeal to both men and women, because while there's romance it's not kissy face stuff. It's real life love, with all its chaos. As for the story, it centers around Ross Poldark, a black sheep of the family who comes back scarred and exhausted from the Revolutionary War in America. On his return Ross must try to salvage his father's estate, help his impoverished tenants, and deal with losing the woman he loves (and that happens like the minute he gets back.) There's lots of mining history, along with the life you might have lived in eighteenth century Cornwall. Ever imagine after your wedding having your Dad hold a cockfight (the poultry variety) for the guests? Inside the house? That kind of life. Each character has their own, distinct voice, so much so that I really didn't need dialogue tags to recognize who was speaking. Demelza, a runaway kid Ross Poldark takes in, is definitely a heroine for the ages, but Ross is every bit as fascinating. By the time I finished the novel I knew I'd be investing in the rest of the series. Technically speaking this is a fantastic piece of work, too. The author has a writing style unlike any I've read, which I've been trying to think of how to describe all week. He keeps the text tidy and well-paced, with terrific detail-weaving, but also infuses it with such passion that I'm not quite sure how he manages it. I read every word, very slowly, which is not like me. I speed through books, but this one was too good to rush. I highly recommend Ross Poldark: A Novel of Cornwall, 1783-1787 as one of the best historical fiction novels I've ever read. Britain used to wait every year for the new Poldark book. We were turned on to the series early, by another BBC series of the books. For some of us, although the new Poldark is terrific, Robin Ellis and Angharad Rees are Ross and Demelza. And Ralph Bates is the definitive George Warleggan. The series is long and sprawls over several decades, so you have a lot of reading ahead! While I love the Poldark books, I don't think it's the best. The best I ever read were Dorothy Dunnett's Lymond series, which takes you by the throat and drags you through the first half of the sixteenth century. So when you want a break from Poldark, try those! Some of us care about historical research, and IMO that's what makes a big difference. I'm glad you recommended this. I'm watching the mini series right now. I like it but I feel it's not giving me as much texture and back story as it should have. I'm hoping the book might be richer than the tv series. I've often wondered how many readers find a series based on tv shows or movies. I know I've recently read several books because they were turned into series and I really enjoyed them. I bought the first book but haven't read it yet. I bought it in part because I'd not heard of it before either but saw the previews and also, because I'm a big fan of Aidan Turner since Being Human (the Brit version) premiered. I have a couple friends who have read the series so far and loved every minute of it, so I think I need to start the book. I loved the original BBC Poldark series, and watched it with my Mum back in the day. I haven't seen the new Poldark or read the books, so I might just give it a try. I love historicals and it sounds like this book is well worth it.